This service provides customized tailored implementation of the document control and records management system and tools to comply with the regulatory environment in the United States and European Union (EU) for management of standard operating documents and the subsequent management of the resulting paper and electronic records. There will be productivity increase and cost savings of more than 90% using our service. Your company will save money from several thousand to millions of dollars adding to your bottom line profit. It is designed to provide you with robust system for managing a document control or records department in a manufacturing company. Document control is an essential element of an effective quality system. Documents demonstrate that the systems and controls used to ensure that finished devices meet specification have been effectively implemented. They communicate desired outcomes, clarify methods, and ensure consistent results. The service takes into account of the national and international laws and their impact on the lifecycle of documents from use in the ISO/FDA manufacturing environment to records retention and disposition. When implemented properly, document controls help reduce the likelihood of defects and minimize field problems. Ultimately, these improvements increase customer satisfaction. Identification and implementation of various quality tools such as 5S as it applies to document control and records management. Identification and implementation of archival practices and how that differs from records retention. Identification and implementation of current security and privacy laws and the effect on the controls inherent to document control and records retention. 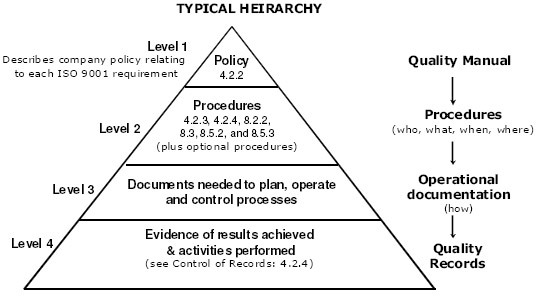 Figure 1 - Example ISO 9001 QMS Documentation - A typical documentation structure and example of documents to control. Quality Record: A record which provides objective evidence of the conformance of products and systems to specifications and process requirements defined by the quality system. Device History Record (DHR): A compilation of records containing the complete production history of a finished device. Device Master Record (DMR): A compilation of documents containing a device's complete formulation and the quality system requirements including procedures and specifications for manufacturing, packaging, labeling, servicing maintenance and installation. Lifetime of Product – time that a device is expected to remain functional after is placed into use. (b) The ability to generate accurate and complete copies of records in both human readable and electronic form suitable for inspection, review, and copying by the agency. (c) Protection of records to enable their accurate and ready retrieval throughout the records retention period. (k) Use of appropriate controls over systems documentation including: (1) Adequate controls over the distribution of, access to, and use of documentation for system operation and maintenance. (2) Revision and change control procedures to maintain an audit trail that documents time-sequenced development and modification of systems documentation.